PYEONGCHANG (Sputnik) - The International Olympic Committee commission recommends to lift the disqualification of the Russian Olympic Committee following the analysis of all doping samples of Russian athletes during the 2018 Winter Games in South Korea’s Pyeongchang, Olympic Athlete from Russia Implementation Group Chair Nicole Hoevertsz said. 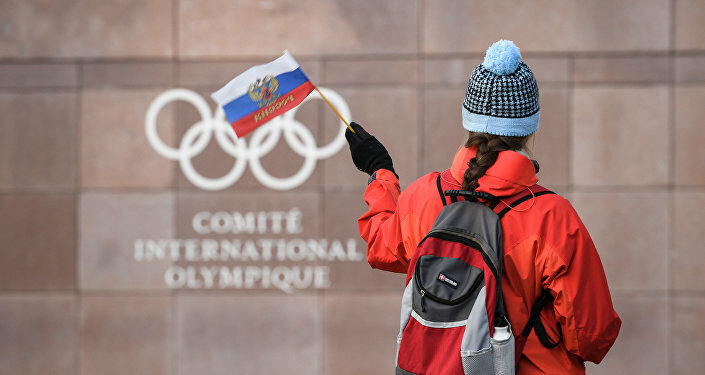 “The OAR Implementation Group recommends that the suspension of the Russian Olympic Committee not be lifted at the closing ceremony on February 25, 2018, and conditions applying to the OAR delegation remain in place … The Implementation Group recommends lifting the Russian Olympic Committee’s suspension once all results of the doping tests of the OAR athletes during the Olympic Winter Games of Pyeongchang 2018 have been confirmed as negative,” Hoevertsz told the IOC session on Sunday. She noted that for the purposes of historical files the results and medals earned by the OAR athletes at the 2018 Olympic Winter Games would remain recorded as OAR. Meanwhile, IOC President Thomas Bach said Sunday that the International Olympic Committee Executive Board has recommended not to remove the suspension of the Russian Olympic Committee until the closing ceremony of the 2018 Winter Games. “The IOC Executive Board decided not to lift the suspension of the Russian Olympic Committee for the closing ceremony of the Olympic Winter Games Pyeongchang 2018 … The suspension of the ROC is considered to be lifted once the Doping-Free Sport Unit has confirmed that there are no additional anti-doping rules violations by members of the OAR delegation,” Bach told the IOC session. The IOC chief noted that the organization would have considered lifting the suspension since Russian athletes as such respected the decision of the IOC EB, but anti-doping rules violations by Russian bobsledder Nadezhda Sergeeva and curler Aleksandr Krushelnitckii in addition to other considerations prevented the IOC from lifting the ROC suspension at the closing ceremony. On December 5, the IOC suspended ROC over an alleged "systemic manipulation" of the anti-doping system in Russia. The allegations have been denied by the Russian authorities. The IOC said that it would allow only "clean" athletes to compete in the 2018 Olympics under a neutral flag as Olympic Athletes from Russia.